On Monday, January 18, CLT Spokes People hosted a screening of Bikes vs. Cars in Charlotte. 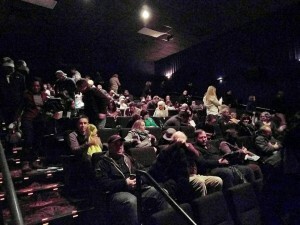 125 of 146 seats were sold, and about 11 people rode bikes to the screening. Thank you to everyone who bought a ticket and helped bring the documentary to Charlotte. The patrons who were there for other movies noticed and commented on the number of cyclists arriving at once. Most people I spoke to seemed to enjoy the movie. Bikes vs. Cars was a provocative film, with strengths and weaknesses noted by the attendees, and I’m glad we all got to watch the movie together. My intention was to help spur a dialog about how we can all help each other ride more and support riders in our effort to make bike riding a normal and expected daily occurrence. The following are some comments (lightly edited for clarity and brevity) shared by people who saw the film. These are examples of the lively and thoughtful dialog among Charlotte bicyclists! Join the dialog by sharing your comments with us at: pamlikestobike@gmail.com. If you missed the showing, you can watch Bikes Vs. Cars online on Vimeo: https://vimeo.com/ondemand/bikesvscars. Bottom line: We all win when people ride bikes. Stay tuned for the CLT Spokes People review of the Bikes vs. Cars film!